On April 4, 2016 Luc Debraine reported on “The Chinese Lives of Uli Sigg”. 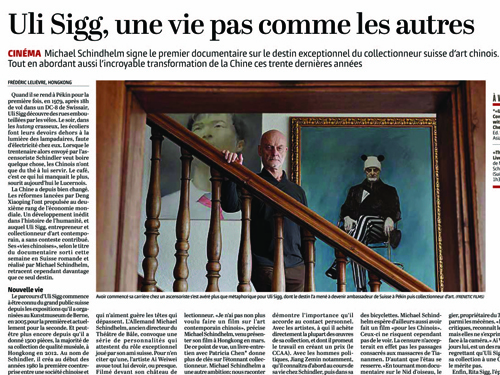 In his article, published in the weekly French-language Magazine L’Hebdo under the title “Le portrait chinois d’Uli Sigg”, Debraine states that an outstanding but enigmatic personality such as Sigg almost “merits” a profound documentary like that by Michael Schindhelm. Please click here to read the article from L’Hebdo (in French only). The same day, the Geneva-based newspaper Le Temps published an article by Frédéric Lelièvre, entitled “Uli Sigg, une vie pas comme les autres”. According to Lelièvre, the documentary not only sheds light on the biography of Uli Sigg, but also on the changes which took place in China during the past decades. Without divulging any business secrets, Lelièvre states, the documentary emphasizes the important role which personal relations played in Sigg’s life. Please click here to read the article from Le Temps (in French only).